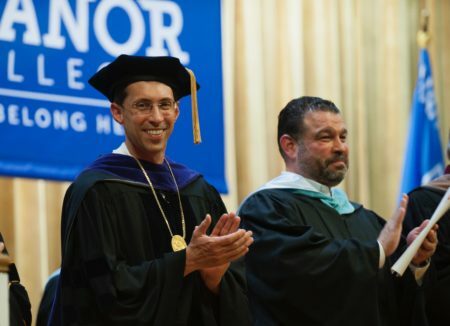 President Peri with Secretary Rivera during the 2017 Manor College Commencement. Secretary of Education Pedro A. Rivera today congratulated Dr. Jonathan Peri on his appointment as Chair of the State Board of Education’s Council of Higher Education. Peri, President of Manor College, has served on the board since 2010 and was first appointed by Governor Rendell. Governor Tom Wolf appointed President Peri council chair earlier this week. Just last week, President Peri made three big announcements that has Manor’s campus and community buzzing with excitement. Starting in fall 2018, Manor College will offer two Bachelor degree programs: the Bachelor of Science in Veterinary Technology and Practice Management, and the Bachelor of Arts in Liberal Studies (pending Middle States approval). The B.A. has five concentration options. Peri’s second announcement was a special $2,000 tuition rate discount for all students enrolling in either of these new programs, called the “Basil Guarantee.” The Basil Guarantee essentially takes the approach that tuition costs go down over the course of the program. This is in sharp contrast to the model of most colleges and stands to support the state’s college degree attainment goals leading up to 2025. Peri’s third announcement was that Manor College is freezing its tuition for the 2018/2019 year as a symbol of its commitment to the community and to further address the national call for keeping tuition within reach. Already one of the best priced private colleges in Pennsylvania, Manor’s President Peri touted the college’s 10:1 student-teacher ratio, and higher than national average graduation rate and starting salaries. In addition to his service on the State Board of Education, President Peri may be the only person in Pennsylvania history to serve on three education related boards simultaneously. He is also a member of the state’s Charter School Appeal Board and the Pennsylvania State Tuition Account Programs (529) Advisory Board. Additionally, he is the Board Chairman of The Walden School in Media and the Interim Board Chairman of the largest Catholic high school in Philadelphia, Archbishop Ryan. President Peri graduated from Villanova University and Widener University – Delaware Law School. He recently completed the Organizational Leadership doctoral program at Eastern University. This makes him one in approximately .00054% of people globally admitted to practice law and having earned the J.D. and the Ph.D.